Take a leisurely ride through historic downtown Wilmington on the FREE Downtown Trolley! Catch the Trolley at designated stops or, flag down the Trolley to board anywhere along its route. You can also track the Trolley on our website or through our App. Click here for App download instructions! 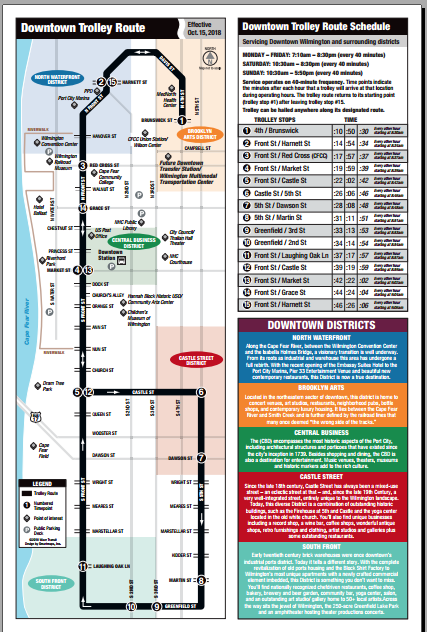 Beginning Monday, October 15, 2018 a new permanent route for the Downtown Trolley will go into effect. Click HERE or on the image below to view or print a new Trolley schedule. Want a detailed list of arrival times for all 15 Trolley Stops? Click HERE to view or print a list of all Trolley timepoints.